by Michael Eggleston* (Advanced Biofuels USA) On January 22, 2018, the 15th International Conference on Renewable Mobility titled “Fuels of the Future” was opened up by a discussion with Members of the European Parliament, as well as representatives from the European Commission and the German government, that addressed setting the political agenda for renewable mobility in Europe. At the heart of this discussion was the recast of the role biofuels have in the Renewable Energy Directive (RED II). From 2021 onward, it has been proposed by the Commission that the volume share of conventional crop-based biofuels in the transportation sector is to be gradually cut in half over the next decade. By 2050 this share would ultimately be phased-out completely in order to achieve carbon dioxide (CO2) reduction targets. Criticism around this discussion was led by the debate that these fuels compete for fertile land with respective agricultural and oleochemical industries. 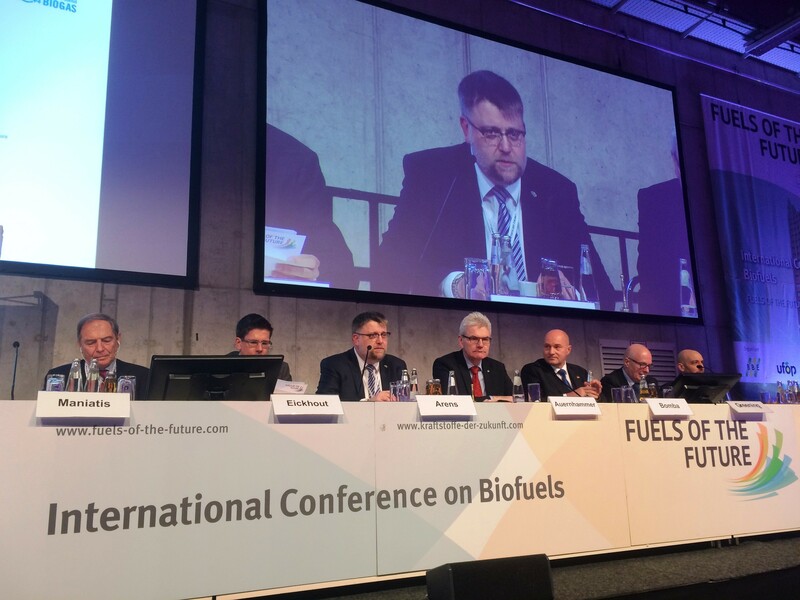 Criticizing the Commission members for their hypocrisy, the Union for the Promotion of Oil and Protein Plants (UFOP) emphasized that EU biofuel producers must not be held responsible for the failings of environmental policy. 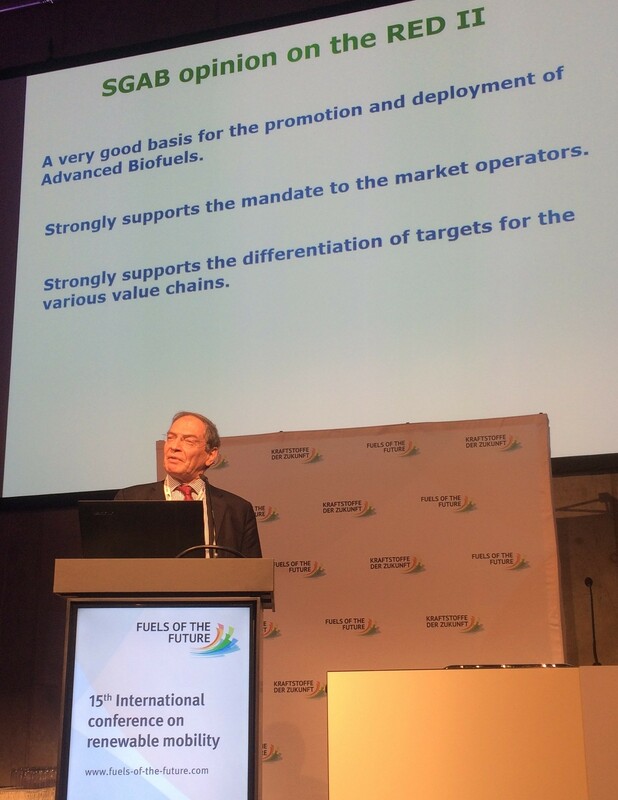 Whereas biofuels are being pressured to become sustainably certified, this is far from being the case for other industries in the expanding global vegetable oil market, elaborated the Union in their most recent annual report on progress and future prospects of biodiesel. In order for secure growth to take place in meeting these reduction targets, a clear plan and mechanism must be spelled out for the transportation sector, suggested Kyriakos Maniatis, Director General of Energy for the European Commission. Energy policy in the EU is driven by CO2 reduction targets which ultimately are focused on achieving near CO2 neutrality from all sectors by 2050. However, with policy makers pressured by the public’s concerns on conventional biofuel’s sustainability credibility, transitioning towards electro-mobility was estimated by Director of Climate Protection and Energy Policy at the World Wildlife Foundation (WWF) Germany, Michael Schäfer, to be the most “rational” decision. Schäfer disclosed that the organization believes that from 2030, new vehicles with an internal combustion engine should no longer be permitted by automotive manufacturers despite the position the German Parliament has taken. Representing the Christian Social Union in Bavaria (CSU) and the German BioEnergy Association (BBE), Artur Auernhammer, replied that the increasing diversification of propulsion technologies, as well as the development and market introduction of alternative fuels, is a challenge, but at the same time is also the key to achieving the goals of climate protection. How Original Equipment Manufacturers (OEMs) will respond will ultimately be a consumer decision, he stated optimistically. 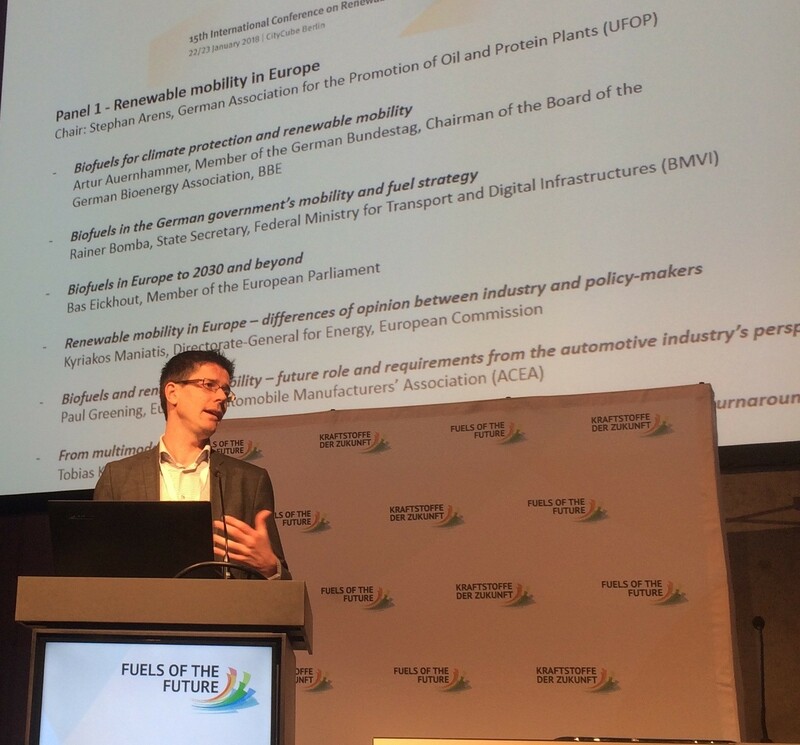 Further polarizing Germany’s position, the State Secretary for the German Federal Ministry for Transport and Digital Infrastructures (BVMI), Rainer Bomba, asserted that it’s impossible to imagine electro-mobility to be a sustainable and economic solution. He declared that cooperation amongst all member states must be made for an effective impact in the transport sector. For British Petroleum (BP), trends with automotive consumers identify that electro-mobility is not yet a clear socio-economically attractive alternative. Ruprecht Brandis, Director of External Affairs clarified results of a recent case study conducted by Aral that collected data from over 1,000 respondents all around Germany. Summarizing the research, he revealed that the majority of consumers still prefer a diesel or gasoline powered engine. About half of the survey participants considered the purchase of an electric vehicle to be a new investment. Out of those participants, only 5% of them considered making the change. For the European Automotive Manufacturers Association, any abrupt transition away from diesel engines would provide additional challenges in meeting intermediate and long term CO2 reduction targets, responded Paul Greening, Director of Emissions and Fuel. Long term targets for the European’s transportation sector must be made in the form of consumer incentives not quotas, he clarified. Currently, these incentives vary widely across EU Member States and are in need of harmonization in order to create a single effective market in the EU. Bringing clarity to Dr. Greening’s position was member of the Parliament for Croatia, Marijana Petir. She elaborated that a realistic approach needs to be taken to achieve harmonization. Differences between member state capabilities need to be respected in supporting what capabilities they already have in developing a diversified renewable energy system. 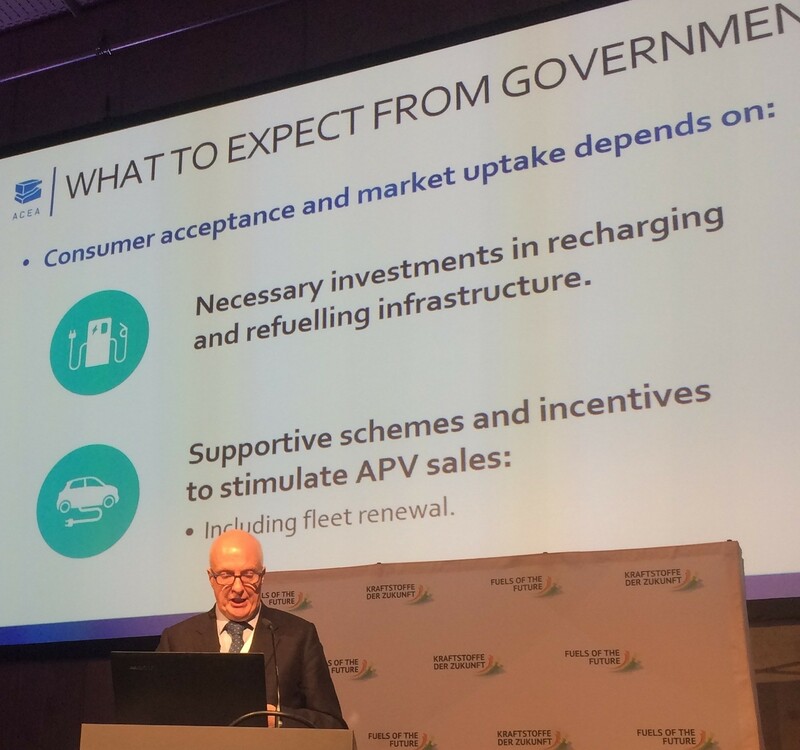 The International Renewable Energy Agency’s Senior Program Officer, Jeff Skeer, expressed that the transition to electro-mobility won’t happen everywhere, not in all sectors and not all at once. He claimed that accelerated market penetration of electric vehicles (EVs) may weaken oil prices and thus secure biofuels’ competitive position over the long term. With EVs projected to make up 30% of global transport by 2050, biofuels needs will be substantial for decades to come. The intergovernmental organization projects crop-based feedstocks to make up about three-quarters of total biofuel share in 2030 and about one half by 2050. Skeer concluded in his presentation that biofuels will remain a long-term alternative in regional markets with weak power grids such as those in Africa and South Asia and in low-cost domestic markets such as those in Brazil. Where does this leave the future for conventional and the prospect of advanced biofuels in Europe? Defending the position of the European Parliament was Bas Eickhout, member of the Parliament for the Netherlands and the European Green Party. He reiterated to delegates that the Parliament has always been consistent with their intentions in regards to their vision for the transport sector. 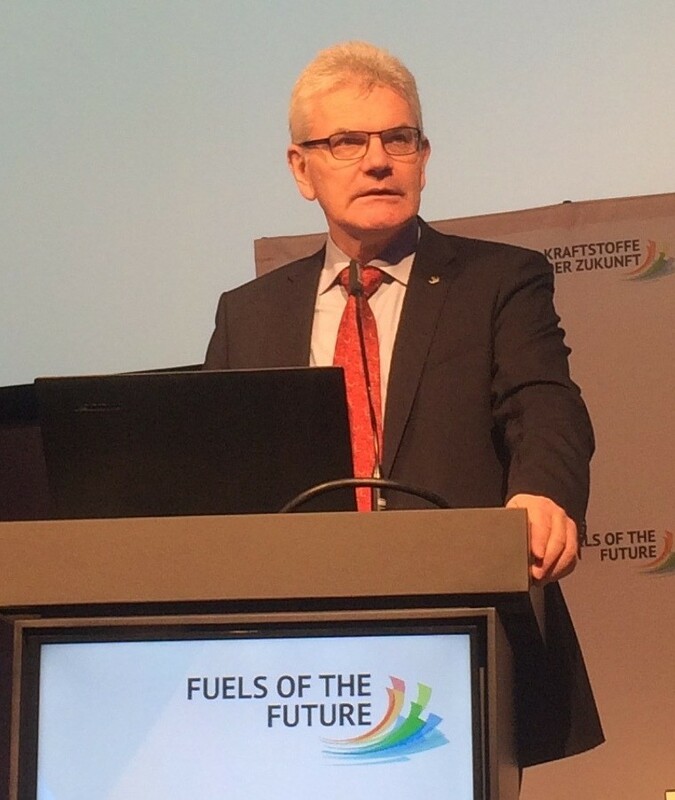 RED II was a political compromise to stunt growth of conventional biofuels in order to make room for advanced biofuels and other options, reassured Eickhout. Answering the call to concerned biofuel producers he suggested that an increase in conventional biofuel volume share would only intensify the impact of poor performing feedstocks and compromise biofuels’ sustainability credibility. Food price, however, is not a fair indicator of indirect land use change (iLUC), since public criticism surrounding conventional biofuel’s sustainability credibility only revolved around a spike in market price, he stated. Eickhout concluded his presentation disclosing that if member states are to take the Paris Climate Agreement seriously that the future volume of advanced biofuels in the EU should not exceed that of current conventional biofuel levels. A final compromise between the Commission, Parliament and the Environmental Council is expected to be announced around October of this year, revealed Eickhout. He reiterated Dr. Greening’s position that harmonization amongst member states is necessary for the development of an effective energy transition. It was predicted that this harmonization will take the form of binding measurement targets in the transportation sector. Till then, it has not yet been decided what positon Europe’s transportation sector will take; lacking a clear solution to meet the transportation sector’s CO2 reduction target goals. Themes of the presentations revolve around the framework for the future of renewable mobility, the future of the combustion engine, biofuel market developments and electro-mobility prospects in the transport sector. 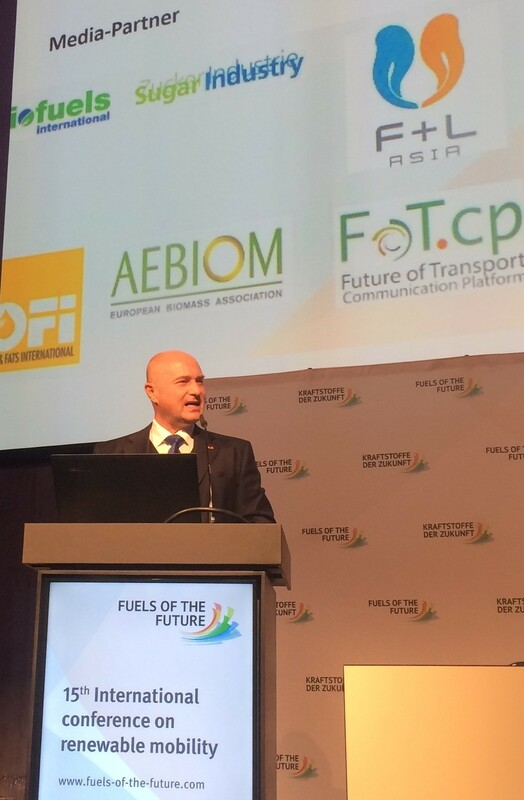 The next “Fuels of the Future ” conference will take place again in Berlin from 21st – 22nd of January 2019.